2 Years Warranty & FREE 1st Service On All New Straight Stairlifts! 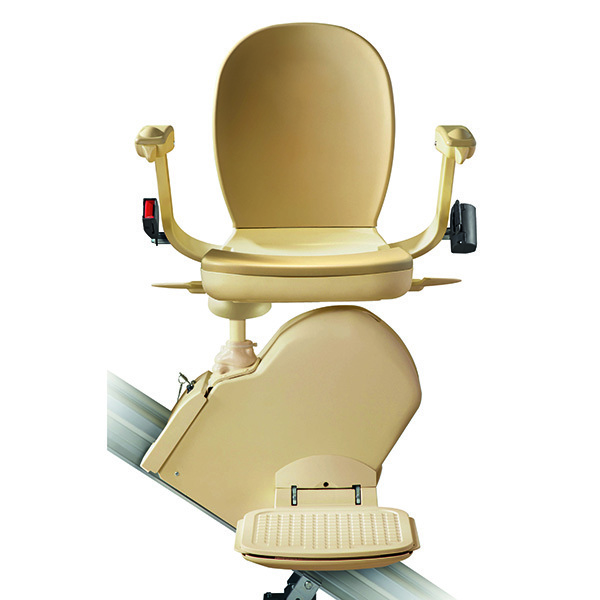 Straight stairlifts are the most suitable solution for staircases with no twists or turns in them. They are available for sale or hire from Central Mobility. All of our new and reconditioned straight stairlifts come with a minimum 12 months warranty but in most cases this is 2 years warranty. 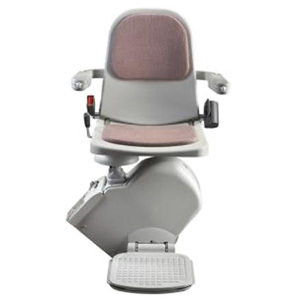 If you decide to rent a straight stairlift then all service, repairs and maintenance costs are included in the monthly charge. Renting a straight Stairlift is a particularly good solution for those looking for either a short term solution or for those that don't like the idea of any unexpected repair bills to pay in the future. 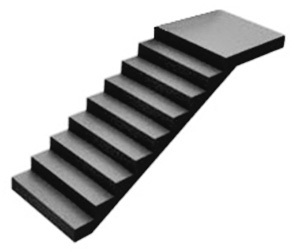 For staircases with a single bend and a square sub landing with one or two steps off to the side, we can also build and install a false step infill. This will reduce the amount of steps left to climb up to the top landing and a cost effective alternative to a curved stairlift. 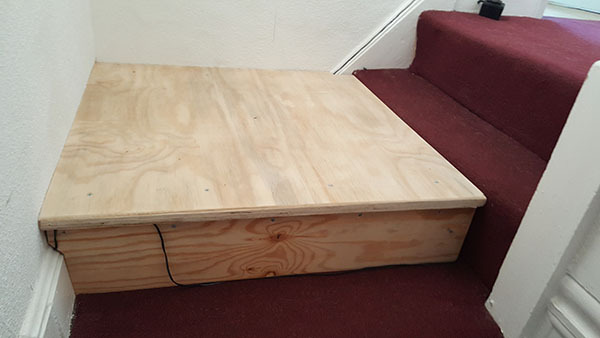 The step can also be carpeted (if provided by the user) so that it blends in perfectly with the existing stairs. 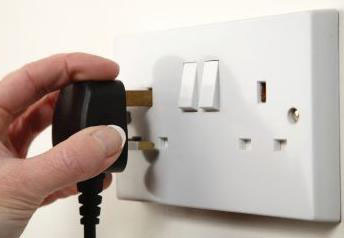 All of the reconditioned straight stairlifts supplied and fitted by Central Mobility are designed to be simply plugged in to a normal house socket at the top or bottom of the stairs. If you are not sure if a straight chairlift will fit on your stairs then you can take a look here at our simple guide on how to measure your stairs. We explain all the key things to look for and how to take simple measurements which can then be emailed to us with some pictures for a quick reply. Today's models at yesterday's prices! Choose from all the leading brands! 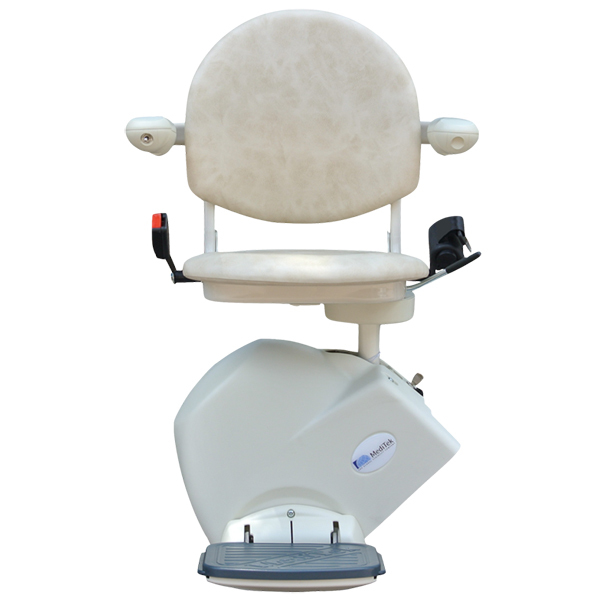 Reconditioned Stairlifts, fully reconditioned, full 12 months warranty! Straight stairlifts available to hire on a monthly basis from just £10 per week! When mum's straight Stairlift finally packed up we called Central Mobility. They were able to remove the old Stairlift and replace it with a new one in just a few hours. Mum wasn't without a Stairlift and it cost a lot less than we were expecting! Thank you! We contacted Central Mobility about a straight stairlift for my dad. The man who came out to see us was really nice and friendly and not pushy at all. They fitted dad's straight lift a few days later with no fuss or mess.